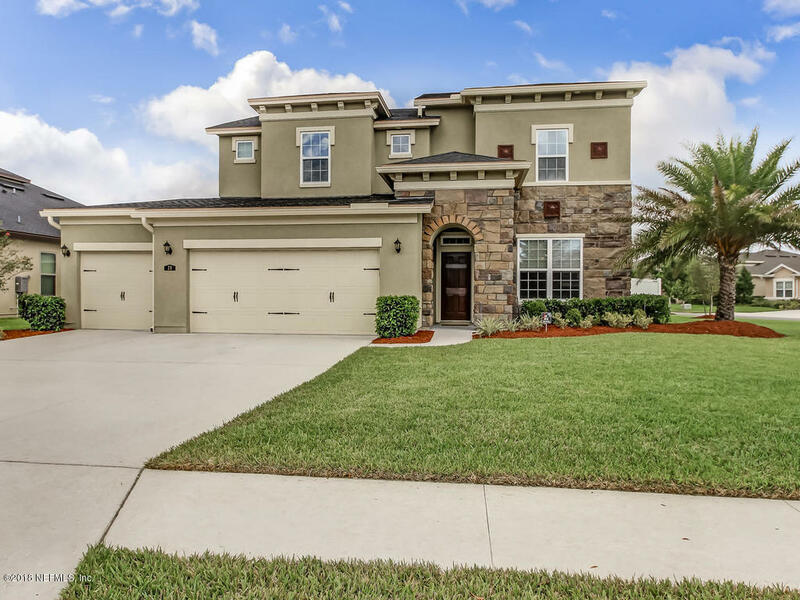 This family home in the heart of Nocatee's Valley Ridge school District, Greenleaf Village, is just around the corner from the park and walking distance to Valley Ridge Academy K-8.This 2-story, open floor plan with hand-scraped hardwood floors has a formal dining/flex room upon entry, large bright and open kitchen with butler's pantry, eat-in area and opens to living room and covered lanai. The huge corner lot with fenced backyard is large enough for a pool with a large paver area with firepit. Living spaces include a downstairs master bedroom suite with walk-in closet, upstairs has 3 more bedrooms, 2 full bathrooms, loft and a bonus/theater room pre-wired for surround.